By kind invitation of the WHPA, via Brenda Myers, Secretary general of the WCPT, World Confederation for Physical Therapy, I was responsible for delivering the closing summary of the Third World Health Professions Regulation Conference in Geneva, Switzerland, on 17 & 18 May. My role was to draw together key messages from the presentations and discussion sessions. The World Health Professions Alliance WHPA brings together the global organizations representing the world’s dentists, nurses, pharmacists, physical therapists and physicians and speaks for more than 26 million health care professionals in more than 130 countries. WHPA works to improve global health and the quality of patient care and facilitates collaboration among the health professions and major stakeholders. I’d been involved for about 15 years in national, regional and international regulation. So the theme for this conference was very attractive to me. This two-day event has demonstrated a certain consensus that Governance, accountability and responsiveness should be an intrinsic part, or the DNA, permeating all regulation systems. It needs to take into account best public interest, justified and proportional in scope and perceived as legitimate. A theme throughout the sessions has been a distinction on the one hand, between the national regulatory environment, set up to ensure quality and safety of patient care. And, on the other hand, maintaining these values in the face of new pressure exerted on regulation systems from workforce shortages, regional integration and globalization. These is an increased focus globally on making sure regulators do not create unreasonable barriers to supply of health services under the guise of “protecting the public”. This is especially the case for systems of recognition of competencies and qualifications of foreign practitioners in their access to markets from bilateral, regional or international agreements. Although numerous models exist, certain principles need to be observed, notably checks and balances between the different stakeholders and, between patients and professionals, an awareness of rights and duties. More than 200 delegates from all parts of the world attended the conference. I think we can make sure that the goals of health professions regulation are patient-centred, involving patient care, patient rights and patient safety, taking into account social and economic welfare and professional practice. The need for a consensus among health regulators, who defines what? The need for sustained political commitment by the two principal actors: decision makers and professionals. This implies a leadership role in regulation for the professions themselves as guarantor of compliance. The need for regulatory bodies to produce more information evidence-based examples to justify measures proposed and to create evaluation mechanisms according scientific criteria. For example, there are no studies about private and public health care services. The need for the regulatory body to understand the day-to-day realities of the health professions they are seeking to regulate. These vary from country to country and, if the regulators are unaware of the reality, how can they regulate? The regulatory framework has to be fit for purpose. Yesterday, we looked at Universal Health Coverage and its associated requirements in terms of access to affordable and quality health care services, robust workforce, and supply shortages, especially in terms of health care professions’ migrations. We noted that, in certain areas, such as Europe, economic realities such as the single market take precedence over regulation and that regulation is frequently viewed as a brake on economic development. We also saw that regulations were deemed trade restrictive, even protectionist, in bilateral and international trade negotiations. Meeting the needs of citizens. The European professional card was highlighted as a unique system at European scale in terms of health professionals’ mobility. In addition, some concern was expressed about the role of standardization within the health care system as a means to circumvent regulation, with possible negative impacts. This type of standards was deemed well adapted to devices but doubts were expressed about how well they applied to medical or surgical procedures. On an international level, there was concern that the migration of health professions does not always follow population needs and that there appeared to be no cross border planning or management. The danger was that, to manage shortages, there would inevitably some kind of de-skilling and de-professionalization at national level. The conclusion was that mobility will not solve most of the problems and there is a danger that some regulations are perceived as obstacles to efficiency and expanded access to care. We need to encourage the concept of safe mobility of health professions and we need to prevent unhealthy competition. We also looked at the challenges specific to health professions’ regulation in Africa. Regulatory issues raised included public interest versus self-interest and the need for the independence of health regulators. In addition, there is not only the lack of knowledge about regulatory issues among professionals that would benefit from cross border sharing of information. The weakness of professional associations on the African continent was also highlighted as well as cultural and gender issues. This morning’s session investigated whether non-technical skills, called NTS, recognized within the context of high risk industries such as aviation, nuclear energy and offshore oil production, could be adapted to health sector in the interest of positive outcomes, team work and patient safety. If skills such as communication, decision making, team coordination, leadership, situation awareness, as well as managing stress and fatigue were recognized, at what stage should they be introduced into the health care profession curriculum: at secondary level, at university level or during later training? And testing or examination method would increase their perceived importance by students and professionals? We then saw three national models described. The looked at the regulatory structure in Jamaica, and what is was trying to achieve nationally and within the context of the single Caribbean market, CARICOM in terms of recognition, accreditation and common competencies. 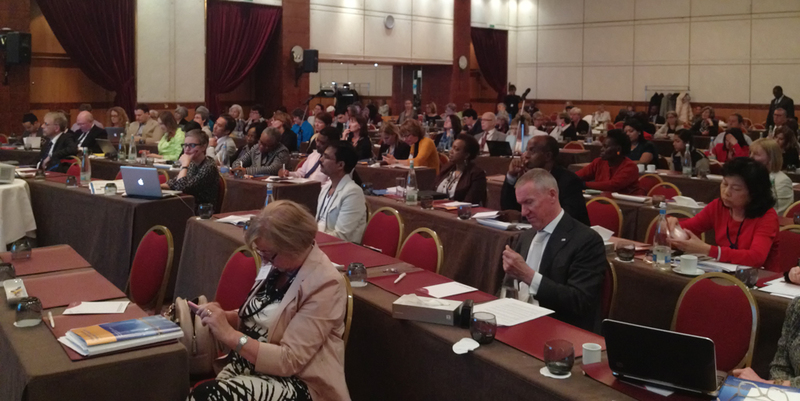 The next focus was South Africa, and the concept of developing shared or “core” competencies among health professions, advancing the cause of interprofessional collaborative practice and enhancing health management and leadership. The five competency clusters identified were identified in professional practice, health system, public health, management, leadership and personal interpersonal skills. We then heard details of the competence the ‘balancing act’ of the competence based approaches for professional regulation from Quebec. Inevitably, governments become more involved in the public interest debate and ask questions, for example, should we move beyond the current diploma-based approach? Are there new ways to demonstrate competence? Is current regulation too precise and comprehensive? And, in general, how to ensure that regulation remains true to its purpose. This afternoon, we looked at research evidence and some of the overriding issues. We saw that there was no organized framework at transnational level and good information is part of good regulation. Maybe we need to work on an agreed set of definitions and terms for regulation. We need to ask ourselves “which models provide the best performance” and start research to collect evidence to invest in regulation models that deliver results. You’ve just heard the final panel, so I don’t need to remind you in detail of its content. A description of 3 years as a new model of health practitioner regulation in Australia. We’ve heard about core functional areas, notifications management and accreditation of education there. We noticed how regulation has changed in the UK since 1858 to now. From self regulation to the designated “independent professional Regulation” since 2003… Could this be a revolution ? Finally, the Israeli experience, with a Law regulating health professionals since 2008 and its impact on the physiotherapists role function. Any regulation model needs further adapting, delivering sustainable performance. It is also important to demonstrate the capability to be flexible to adapt and perform well in a variety of market conditions. In that sense it is very important to identify trends at an early stage. We hope you all found this enlightening and, most of all, engaging. We have all been given much to think about in terms of the challenges of health profession regulation and factors we may wish to consider in addressing these challenges. We all trust that WHPA will maintain and reinforce its role as “think-tank” in terms of health professions regulation on a global level and looking forward to the next WHPA regulation conference. Ladies and gentlemen, I would like to leave you with the message that regulation whatever the model is a responsibility and a public duty and not an option. The discussions we have had over the last two days have enriched an ongoing process. No-one has the magic answer but we’ll get closer to finding it by getting together and exchanging views and experience. Thank you to the keynote speakers and panellists for their relevant and constructive presentations. Thanks to WHPA and Brenda Myers for their work in organizing this exceptional event. 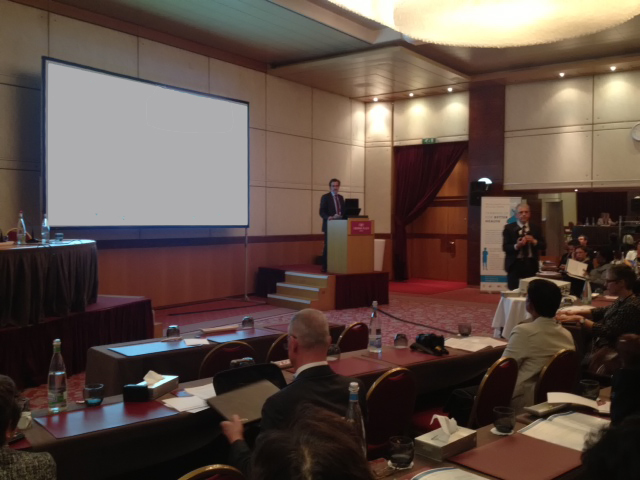 And most of all, thank you all for joining us here in Geneva and making the WHPA conference such an outstanding success. You are currently browsing the Orlando Monteiro da Silva blog archives for May, 2014.